On november 2th 2015 we opened our doors for the first time, and we made a booming start. Since that day we haven’t stopped statisfying our guests every day, proven by our number 1 Tripadvisor ranking. If you’d like to visit us for a drink or a meal we suggest you to use our online reservation system. You can do this by clicking on the “reservation” button in the top menu or by visiting our Facebook page. In 2017 we opened our brand new hotel with 8 rooms and we are planning to add 12 more rooms in 2018/2019. We open our doors everyday at 12AM. You can check out our lunch/diner menu by clicking here. 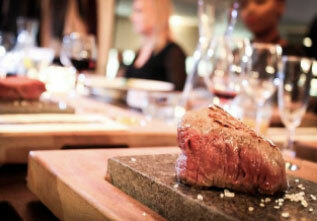 Our speciality is meat served on a hot stone. We offer several beautiful pieces of meat in different sizes which we serve raw on a 350ºC preheated stone. You are in control of your own meat, wether you want it medium rare or well done, it’s in your hands. We are looking forward to welcome you in our restaurant.